Each year, the Junior League of Long Beach (JLLB) recognizes one of its longtime members who has taken her League training and put it to the best use possible, serving the League and community at large through exemplary leadership and service to others. Cynthia D. Terry is one such woman, and she has been selected by a committee of her peers to receive the League’s highest honor: The Helen D. Newcomb Award. She will be recognized at the JLLB’s Annual Dinner on Wednesday, May 15, 2019. Terry, a retired educational leadership coach and Long Beach Unified school principal — known for her time at Naples and Bret Harte elementary schools, Hamilton Middle School and Cabrillo High School in a 38-year career with the district — will be the first to tell you that her time in the Junior League helped establish the foundation for her lifelong dedication to voluntarism. Outside of her work in education and beyond the Junior League, Terry is active in many organizations across the community, including: Assistance League of Long Beach, currently serving as chairwoman of that organization’s capital campaign; Alpha Kappa Alpha Sorority, Inc., Theta Alpha Omega Chapter, where she serves on the executive committee; the board for the Pearl Foundation, Inc.; the executive committee for the Harbor Area Chapter of The Links; St. Matthews Parish, as a lector; and Cal State Long Beach Alumni Association’s board, having received her undergraduate education there and a master’s degree from Pepperdine University. Terry attributes her initial passion for community volunteerism to her late mother of seven, Ruby M. Terry, who exemplified the importance of uplifting all members of the community, especially those most in need of support. 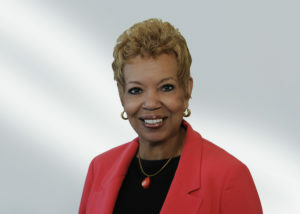 Terry has already been recognized with numerous awards, including the 2013 Press Telegram Amazing Women Lifetime Achievement Award; the 2016 Assistance League of Long Beach President’s Award and the 2017 Make a Difference Award for exemplary leadership and service; the 2018 CCEJ Humanitarian Award; and in 2019, the Long Beach NAACP honored her as a Passing the Torch of Leadership recipient. Terry said she’s surprised and delighted to be selected for the prestigious Helen D. Newcomb Award from the Junior League of Long Beach. The Helen D. Newcomb Award committee said Terry, who has long been a sustaining member of the League, truly deserves the award because she’s the embodiment of the organization’s mission to promote voluntarism, develop the potential of women and improve the community through the effective action and leadership of trained volunteers. Respectfully submitted for your consideration by the Helen Newcomb Award Committee 2019-20: Kimberly Neipling, Janice Merriweather, Mary Lamo, Heather Brel and Ashleigh Ruhl. Click here to see past recipients of the Helen D. Newcomb Award.